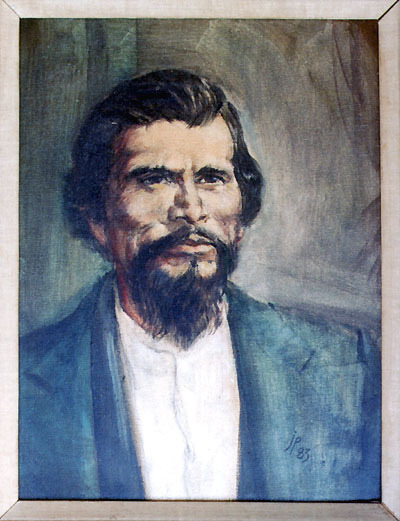 Artist's rendering of Tiburcio Vasquez, born Apri 10, 1835* in Monterey, Calif.; died in San Jose on March 19, 1875, at 1:35 p.m., when a noose tightened around his neck. In between was a 23-year reign of terror as a bandit  far outlasting the 3½-year career of the more famous outlaw Joaquin Murrietta. Sometime in 1871 the "Scourge of California," as Vasquez was known, used a large rock formation in Agua Dulce as a hideout. Today known as Vasquez Rocks, the area is a Los Angeles County park. * Not August 11. See Boessenecker 2010:13. He was born April 10 and celebrated his birthday on his Catholic saint's day, August 11. HS3020: Original portrait in Santa Clarita Valley Historical Society Collection.